Discover the secrets of the murderous barber! A new evil haunts the streets of 18th Century London. People are going missing, but their bodies aren't being found. Adventure with the watchmen as you search for clues and solve diabolical puzzles in your quest for the truth. 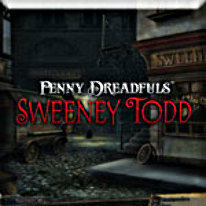 Discover the grim secrets of the murderous barber of Fleet Street, Sweeney Todd. •Full soundtrack that you can take with you!